This is an Event Chart for my purchase of a condominium on October 27th, 2015. It is the first place to live that I have ever bought on my own, without buying it jointly with a husband. I am not counting the two other houses I bought during my ill-fated career as a real estate investor. And you’re about to see why I should have known about Event Charts back in the day! In essence, buying a “base of operations” on my own is similar to a technique recommended by Kapiel Raaj: Rewriting your stars by forming your own corporation as a sole proprietor. With the settlement meeting starting at 1 pm EDT, it is just past the Full Moon which happens earlier in the day, indicating culmination of something I’ve been working toward. Full Moons also help a person be able to “take the heat” of life and handle it well, and not be knocked-off one’s equilibrium. A lot of nice auspicious factors show up: Two Raja Yogas (a combination for fame and achievement), three Wealth Yogas, and a Bhadra Yoga (read on to see how cool this is). With a Sagittarius ascendant, the Ruler of the chart is Jupiter. It forms two Raja Yogas as ruler of the 1st and 4th Houses, landing in the 9th House. (Ruler of two Initiative Houses, landing in a Luck House — in fact the 9th is considered luckiest of all.) Jupiter is also casting a nearly exact one-way trine upon the Ascendant degree, indicating a Divine hand at work in getting me to this place, six years after filing for bankruptcy. Jupiter rules children, and the impetus for this move came from my daughter, who started the internet search on behalf of both of us, and she’s the one who found the right condo development! Venus-Mars-Jupiter indicate a passionate person who seeks knowledge through relationships and sensuality, and they teach topics related to marriage and relationships. This could bode well for me earning income through this kind of teaching; it’s also a good combination for creativity and designing. We’ll have to see how, and if, the Venus factor suffers relative to Jupiter; there is a risk that Jupiter’s high-handedness could overwhelm Venus’ practical emphasis on emotional truth (what “ought to be” vs. what “is” in relationships). As Venus also rules the 6th House of Arguments and Debts, I could get into fights with other gurus (Jupiter is the planet of gurus) — will have to watch out for that. Sun is debilitated in Libra, but gets help from Venus, by way of a “mutual exchange,” since both of these planets are in each other’s signs. (Sun rules Leo and is in Libra, Venus rules Libra and is in Leo.) They support each other: The Sun’s light supports Venusian skills like art, music, acting, while Venus’ charm supports the Sun’s ability to promote long-term visions and plans, and get others’ buy-in to them. Moon is in 5th House, indicating good fortune for children (I’m making this move for the benefit of my daughter). It also indicates “good fortune from the mother” (me!) By Lunar Mansion, it is in Ashwini, good for beginnings of all types. Ashwini’s symbol is two horses pulling a chariot, and has that kind of horse energy, where you can move fast and get things done quickly. Ashwini is ruled by Ketu the South Node, which contracts things and pares away non-essentials (I’ve had to sell-off or give away a lot of things, to fit into this smaller space). A lot of concentrated force. Mercury is Exalted in Virgo, joined Rahu who also does well in Virgo. Both are in the 10th House of Career. This is highly auspicious, as an Exalted Mercury in one of the Houses of Initiative forms a Bhadra Yoga, one of the five “great person” yogas. Bhadra means “blessed” or “fortunate.” Mercury operates at a very high level, facilitating life’s affairs and giving great ability to speak, manage details, and discriminate between what is really important and what is not. With Mercury also ruling the 7th House of Relationships, landing in 10th could bode well for a career in communications about this subject (confirming the Venus-Mars-Jupiter conjunction). Since Rahu explodes anything it touches, its influence here could lead to a quite prolific production schedule of writings and videos on this subject. 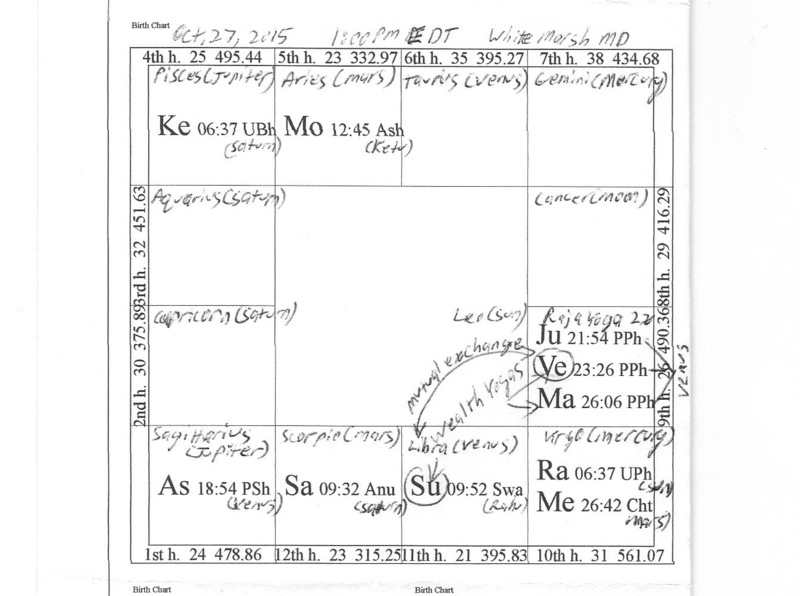 Possible connection to foreign lands, products, subjects, or unusual things (and Vedic astrology is already foreign!). Saturn in Scorpio lands in the 12th House for this chart. One of the “difficult” houses, this is the House of Seclusion and Losses. However Saturn landing in a difficult house tends to suppress the difficulties of that house. Saturn is a planet of solitude anyway, and here it’s landing in a house that favors solitude. This placement promotes a “simple life” (which I need anyway) and the ability to work and focus alone in a quiet space (which I do anyway). It also favors spiritual pilgrimages, which I’ve wanted for a long time. Jupiter’s placement as Ruler of 1st/4th in the 9th also favors these kinds of trips. And Mars, as Ruler of the 12th landing in the 9th, favors interest in enlightenment, study abroad, and charity to religious organizations and institutions of higher learning. Might I finally get to go on that trip to the temples of India? Saturn rules the 2nd House of Income and the 3rd House of Self-Effort. Landing in 12th, it promotes earnings from work with philanthropic, correctional, or spiritual organizations, including speaking at spiritual conventions and after pilgrimages, writing about spiritual matters, and successful efforts in foreign countries. Mars and Saturn also cast their special one-way aspects upon each other: Mars aspects Saturn 4 houses away from itself, Saturn aspects Mars 10 houses away from itself. This is favorable for both discipline (Mars) and determination (Saturn), the ability to keep on working until you win, being competitive and unstoppable, with good technical ability too. The downside is that this combination also gives blunt speech because it won’t suffer fools gladly. But I hope the Bhadra Yoga of Mercury will be enough to make me apply such criticism only where it’s really warranted! The final planet to consider is Ketu, the South Node, landing in the 4th House of the Home. As Ketu is the planet of “divine discontent,” causing dissatisfaction with the imperfections of this world, we will have to put forth extra effort to promote inner serenity wherever we are, no matter what’s going on. It indicates we may not live in this condo for very long — but it’s my intention to remarry anyway, so moving out to move in with my new husband would be a good thing! Of greater concern is the possibility of trouble with cars; will have to invoke divine protection for this. (The 4th House rules fixed assets, and cars are considered to be a fixed asset in Vedic astrology.) Perhaps the influence of a strong Jupiter (ruling Ketu by sign, Pisces) and Saturn (ruling it by Lunar Mansion, Uttara Bhadrapada) will lighten this up a bit. The majority of planets are concentrated in Houses 9 through 12, the houses of focusing on interaction with the world at large. This indicates that my public profile is likely to rise as a result of my living here. And all planets are moving direct, none are retrograde, indicating the ability to move forward with my plans without much confusion, interruption or obstacles. This entry was posted in Blog Articles, Vedic Astrology and tagged Electonal Chart, Home buying, Jyotish, Kapiel Raaj, Lunar Mansion, Muhurta, Nakshatra, Raja Yoga, Vedic Astrology on October 25, 2015 by rewriteyourstars.